Study design: Beagle dogs were treated with increasing doses of trisodium zinc pentetate (Zn-DTPA) in a novel oral solid tablet form for seven days to determine its toxicity with regard to changes in hematology, clinical chemistry and body weight. Results: No changes of the assessed parameters were observed between treated and control group independent of the applied dose. 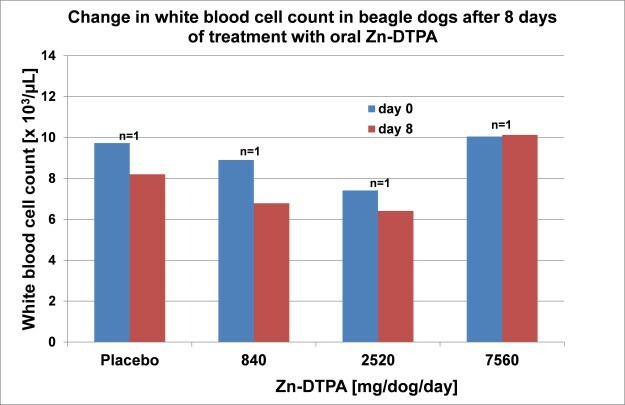 Conclusions: The maximum tolerated dose of this Zn-DTPA formulation is supposed to be higher than 7560 mg/dog/day, demonstrating the nontoxic nature of this Zn-DTPA formulation and suggesting its suitability for protracted treatment in humans.